ALX homeobox protein 1 is a protein that in humans is encoded by the ALX1 gene. The specific function of this gene has yet to be determined in humans; however, in rodents, it is necessary for survival of the forebrain mesenchyme and may also be involved in development of the cervix. Mutations in the mouse gene lead to neural tube defects such as acrania and meroanencephaly. In Darwin's finches, inhabiting the Galapagos islands, ALX1 has been linked to the diversity of beak shapes. ALX1 has been shown to interact with IPO13. ^ Gordon DF, Wagner J, Atkinson BL, Chiono M, Berry R, Sikela J, Gutierrez-Hartmann A (Jul 1996). "Human Cart-1: structural organization, chromosomal localization, and functional analysis of a cartilage-specific homeodomain cDNA". DNA and Cell Biology. 15 (7): 531–41. doi:10.1089/dna.1996.15.531. PMID 8756334. ^ Régnier CH, Tomasetto C, Moog-Lutz C, Chenard MP, Wendling C, Basset P, Rio MC (Oct 1995). "Presence of a new conserved domain in CART1, a novel member of the tumor necrosis factor receptor-associated protein family, which is expressed in breast carcinoma". The Journal of Biological Chemistry. 270 (43): 25715–21. doi:10.1074/jbc.270.43.25715. PMID 7592751. ^ a b "Entrez Gene: CART1 cartilage paired-class homeoprotein 1". ^ Lamichhaney S, Berglund J, Almén MS, Maqbool K, Grabherr M, Martinez-Barrio A, Promerová M, Rubin CJ, Wang CZamani N, Grant BR, Webster MT, Andersson L (11 February 2015). "Evolution of Darwin's finches and their beaks revealed by genome sequencing". Nature. 518: 371–5. doi:10.1038/nature14181. PMID 25686609. Zhao GQ, Zhou X, Eberspaecher H, Solursh M, de Crombrugghe B (Sep 1993). "Cartilage homeoprotein 1, a homeoprotein selectively expressed in chondrocytes". Proceedings of the National Academy of Sciences of the United States of America. 90 (18): 8633–7. doi:10.1073/pnas.90.18.8633. PMC 47412. PMID 7690966. Zhao Q, Behringer RR, de Crombrugghe B (Jul 1996). "Prenatal folic acid treatment suppresses acrania and meroanencephaly in mice mutant for the Cart1 homeobox gene". Nature Genetics. 13 (3): 275–83. doi:10.1038/ng0796-275. PMID 8673125. Cai RL (Sep 1998). "Human CART1, a paired-class homeodomain protein, activates transcription through palindromic binding sites". Biochemical and Biophysical Research Communications. 250 (2): 305–11. doi:10.1006/bbrc.1998.9257. PMID 9753625. Qu S, Tucker SC, Zhao Q, deCrombrugghe B, Wisdom R (Jan 1999). "Physical and genetic interactions between Alx4 and Cart1". Development. 126 (2): 359–69. PMID 9847249. Iioka T, Furukawa K, Yamaguchi A, Shindo H, Yamashita S, Tsukazaki T (Aug 2003). "P300/CBP acts as a coactivator to cartilage homeoprotein-1 (Cart1), paired-like homeoprotein, through acetylation of the conserved lysine residue adjacent to the homeodomain". Journal of Bone and Mineral Research. 18 (8): 1419–29. doi:10.1359/jbmr.2003.18.8.1419. PMID 12929931. Rual JF, Venkatesan K, Hao T, Hirozane-Kishikawa T, Dricot A, Li N, Berriz GF, Gibbons FD, Dreze M, Ayivi-Guedehoussou N, Klitgord N, Simon C, Boxem M, Milstein S, Rosenberg J, Goldberg DS, Zhang LV, Wong SL, Franklin G, Li S, Albala JS, Lim J, Fraughton C, Llamosas E, Cevik S, Bex C, Lamesch P, Sikorski RS, Vandenhaute J, Zoghbi HY, Smolyar A, Bosak S, Sequerra R, Doucette-Stamm L, Cusick ME, Hill DE, Roth FP, Vidal M (Oct 2005). "Towards a proteome-scale map of the human protein-protein interaction network". Nature. 437 (7062): 1173–8. doi:10.1038/nature04209. PMID 16189514. 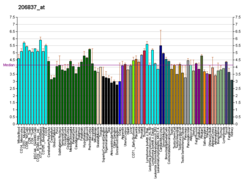 Human ALX1 genome location and ALX1 gene details page in the UCSC Genome Browser. This article on a gene on human chromosome 12 is a stub. You can help Wikipedia by expanding it.